A growing number of printers have switched lately to low energy UV printing (LED, LE) or are planning to retrofit their printing machine with such a system. However, there is still some uncertainty with regard to the appropriate blankets: A traditional UV blanket is not sufficient for this kind of fast curing, low energy UV printing. While it is necessary to have an EPDM surface for better resistance to aggressive UV curing inks and washing agents, this surface must be optimised to prevent ink trapping (because the real problem ist the risk of ink contamination, especially in the yellow unit!). Moreover, a fine micro-ground structure is important in order to ensure a sharp dot reproduction. BIRKAN Dot-Master Brilliant UV, likewise with a new surface compound formula, and an optimised, microground surface texture for homogenous solids, low dot gain and very clean halftones. For more ample information, please contact our Sales team. We have revised once again our printing blanket core range. We are always striving to keep our range up-to-date and clearly structured, as it is offering such a large selection of very diverse blanket qualities for any offset application. 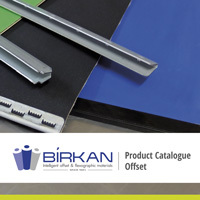 This latest version of our "Product Catalogue Offset" contains our current core range. Products which are not available any more have been removed, whereas some interesting novelties were added. Of course we can provide you on request with a number of other quality articles which are not listed in this catalogue. Please find the new Product Catalogue for download here (0.8 MB). 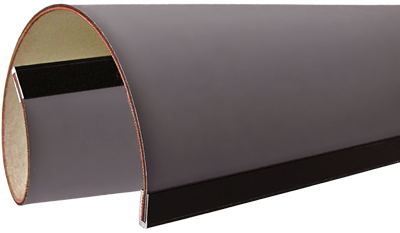 Stripable varnishing plates: Folacoat Advance with polymer surface, Super Strip 2 with EPDM surface.